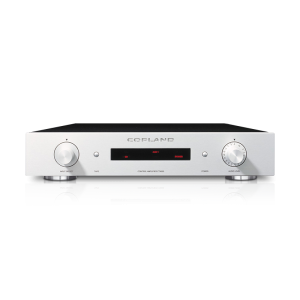 Intended to be at the centre of a high performance audio system, the CTA305 is a flexible control amplifier which features switching of five line-level inputs, including a tape monitor loop, and a built in RIAA phono circuit accommodating moving magnet and high output moving coil cartridges. For the listener with a large investment in LPs, this amplifier provides an opportunity to recover more nuances from irreplaceable records. Besides amplifying the signal a few times and providing the facility of switching input sources, the primary purpose of the preamplifier is to control the sound level while matching the impedances between the signal source and the power amplifier. The amplifying and buffering circuitry of the CTA305 is composed by reliable type 6922 low noise valves, presenting high impedance towards the signal sources in order not to load the audio signal. Conversely, the output impedance is low and therefore capable of driving an interconnect cable of unspecified electric characteristics and a power amplifier with an input impedance of anywhere between a few thousand and one million ohms. High quality polypropylene and polystyrene capacitors are used exclusively in the signal path of the CTA305, These capacitors eliminate blurring of sonic details coursed by dielectric losses and dynamic changes of capacitors found in conventional components. All resistors are of close tolerance film construction, providing high accuracy and long-term stability. Discrete dc power supply regulators with nearly zero output impedance provide stable plate voltages. By also employing regulated supply voltage to the filaments of the valves, the working conditions for the valves handling the delicate audio signals are completely stable from a dc point of view, unaffected by the fluctuations of the ac-line voltage. The CTA305 employs motor driven precision volume control and can be fully operated from the Copland remote control unit. Factory set for destination country only. Shipping Weight : 7 kg.